When space is at a premium in the garden, it makes sense to grow things that taste better fresh and are expensive to buy in the shops. Asparagus really fits the bill. What’s more, it’s easy to grow, tastes luxurious and once established will grow with very little effort for years and years. 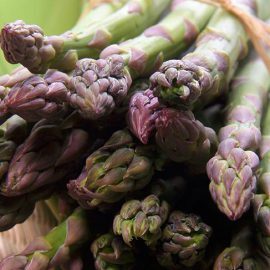 Asparagus is best used from fresh, but can be stored for a couple of days in the fridge if placed in a jug of cold water. Below is a guide to growing asparagus in your garden or allotment. Buy Unwins pre-packed asparagus crowns in spring and plant them immediately in the ground. Choose a sunny, well drained site sheltered from strong winds. Dig over the area thoroughly and incorporate plenty of well-rotted organic matter. If your soil is poor, dig in Gro-Sure Vegetable Growing Compost. If you only want a few plants, these can be planted into individual, flat-bottomed holes. 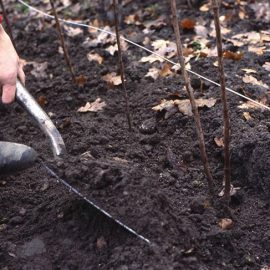 If you want a large permanent bed of asparagus, then it’s best to dig out a planting trench. Dig out a planting area that is 20cm (8 inches) deep and at least 30cm (12 inches) wide. Gently spread the roots of each asparagus crown out over the surface of the soil in the trench/hole, so that they lie flat on the surface. Cover with 5cm (2 inches) of sifted soil straight away. It’s very important not to let the crowns dry out. As the plants start to grow continually cover them over until there is a mound of good soil on top of them. Keep the plants well watered throughout growing season and hand weed to prevent damaging the roots. 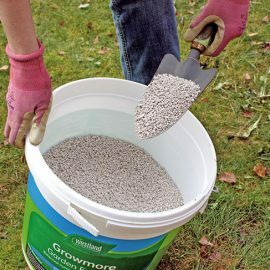 Feed with Growmore Fertiliser before the spears emerge. Asparagus is usually pest and disease free. Slugs are likely to be the worst problem and will make holes in the spear. Try using Eraza Slug and Snail Killer to protect your plants as soon as the spears start emerging. Asparagus beetle can also be a nuisance. Do not harvest the spears of asparagus in the first year. Allow them to grow into ferny foliage and establish. This will allow carbohydrate stores to build up in the crown giving better quality spears in the following growing season. If possible, resist the temptation in the second year as well. This will pay off in the long run. In the third year, you can harvest the asparagus spears when they reach 15cm (6 inches) tall. Remember that the crowns will grow double in size each year, and will be difficult to remove by digging if left for many years.